You can print batches of cards with the 100-card hopper, or print single cards or rewritable cards with the hand-feed card slot on the front. Enjoy the budget-friendly rewritable capabilities. 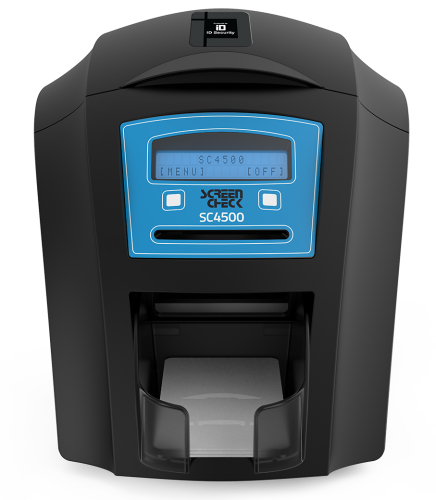 Using a special rewrite card, the ScreenCheck SC4500 ID Card Printer can print and erase the same card over and over in either monochrome blue or black. Rewritable technology is perfect for issuing temporary badges or visitor passes, among other solutions. The ScreenCheck SC4500 ID Card Printer uses a USB interface, Ethernet and Microsoft certified, Mac OS X compatible, plug and play driver that makes the printer simple to install and easy to use. There are a variety of standard and optional features making the SC4500 even smarter. The SC4500 is a single-sided printer which can be easily field upgraded to double-sided by means of a simple drop-in upgrade. The SC4500 Duo is pre-configured as a double-sided printer. 300dpi colour dye sublimation, monochrome thermal printing and rewritable technology. The user has the option to print a HoloKote� security watermark across the card surface. When used with HoloPatch� cards, one area of the HoloKote watermark is highlighted as a high visibility security seal. A choice of 4 fixed HoloKote patterns are selectable from the printer driver. Magnetic stripe encoding: HiCo and LoCo encoder ISO 7811. 3 years limited depot warranty. USB rev1.1 (USB 2.0 compatible), Ethernet. Windows XP, Vista, 7, 8.1, 10 (32 and 64bit) Windows server 2003 R2 SP2, 2008, 2012, 2016. GNU/Linux and Mac OS X 10.9.0 onwards. External power supply 100-240V 50-60Hz autoranging. 53mm L x 206mm W x 233mm H (17.8 L x 8.1 W x 9.2 H) including hopper and stacker. Sheltered office environment 10�C to 30�C (50�F to 85�F). 125 cards per hour for colour and 7 seconds per card for monochrome. The ScreenCheck SC4500 Single Sided ID Card Printer features a 3-year warranty.